[prMac.com] New York, New York - TV Guide magazine, which is one of the most popular entertainment magazines in the US, partners with the world's largest digital magazine newsstand, Magzter, to mark its digital expansion. The magazine covers every corner of the television medium, which ranges from behind-the-scenes looks at broadcast, cable, syndicated, and online programming to sneak peeks at television's most intriguing plot lines. TV Guide magazine has been America's most trusted television authority for over six decades now, thanks to its exclusive celebrity interviews, in-depth previews and exclusive scoops on all the hottest TV shows. The magazine not only lists the schedule of the most sought-after TV shows on popular channels, but also enlightens the readers what's actually worth watching. The latest issue of TV Guide magazine has interesting columns such as 25 shows to binge right now and where to stream them, The Roush Review, exclusive interview with Marg Helgenberger and Matt Roush's top 10 must-see shows. "TV Guide magazine is an ultimate compendium for the keen followers of American TV shows, as it makes their TV viewing time worthwhile. The magazine's interviews with leading celebrities take the readers closer to their favorite TV stars, while its reviews are concise and unbiased. We would like to extend a warm welcome to TV Guide magazine and we are sure that it will be a raging success on Magzter's digital platform too." - Girish Ramdas, CEO, Magzter Inc.
"The prestigious TV Guide magazine has won the trust of millions of readers in the US, who choose what to watch on TV based on the illuminating columns of this magazine. With this esteemed magazine becoming available on Magzter now, it is rest assured that the readers can keep an eye on the latest TV shows on the go and be sure of not missing a single episode." - Vijay Radhakrishnan, President, Magzter Inc.
Magzter - Magazine & Book Store 4.2 is free and available worldwide through the App Store in the News category. 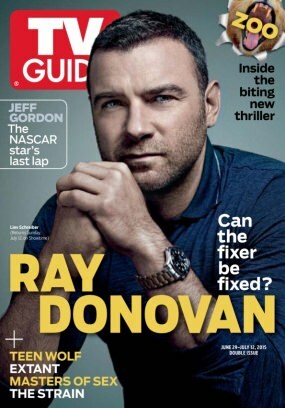 This bi-weekly, TV Guide magazine is priced at $14.99 (USD) for an annual subscription on Magzter. Magzter also launched a path-breaking "All You Can Read" subscription service called Magzter GOLD, which gives digital readers unlimited access to 2,000+ magazines for a low monthly price. The app is also available on Google Play, and Windows 8, the web, Amazon App Store, Kindle Fire, and NOOK and is expanding to more platforms soon. Magzter's easy purchase and renewal systems ensure subscriptions are paid on time, eliminating the need for paper checks and postal mail issues. Users can buy their magazines on any of the above devices/platforms and seamlessly port their purchases to any other devices, a feature unique to Magzter. Magzter is the world's largest and fastest growing global digital multi-platform magazine newsstand with over 26 million digital consumers, more than 6,000 magazines from over 2,500 publishers. Headquartered in New York, Magzter has its local offices in London, Paris, Barcelona, Munich, Amsterdam, Helsinki, Cape Town, Chennai and Singapore and will soon be expanding to other countries. Founded by global entrepreneurs, Girish Ramdas and Vijay Radhakrishnan in June 2011, Magzter enables magazine publishers around the world to create and deliver digital editions of their titles to global consumers. Powered by its proprietary OREY Click Publishing System(R), Magzter also enables their customers to publish interactive/audio-visual content in the magazine as it supports HTML5. Magzter launched Magzter GOLD subscription service to give digital readers unlimited access to thousands of magazines for a low monthly price.All Material and Software (C) Copyright 2015 Magzter Inc. All Rights Reserved. Apple, the Apple logo, iPhone, iPod and iPad are registered trademarks of Apple Inc. in the U.S. and/or other countries. Other trademarks and registered trademarks may be the property of their respective owners.